Everett "Cotton" Owens didn't make much of a dent as a driver at Darlington Raceway, despite it being the biggest track in his home state, and despite his status as one of the top 50 drivers in NASCAR history. But in 1970, as a team owner, he knocked a hole in the old track. "That was really a special weekend for me," said Owens, the long-retired driver/car owner from Spartanburg. "I don't think it could have gotten much better. "It was indeed special. On Labor Day weekend in 1970, Owens pulled off a rare double.On Saturday night, he was inducted into the National Motorsports Press Association Hall of Fame, which is just outside the fence on the backstretch of the historic track, and on the following Monday, Buddy Baker gave him a victory in the Southern 500, the oldest big race on the oldest superspeedway in NASCAR. Only one other time, when Cale Yarborough won the 500 in 1973 on the same weekend as his boss Junior Johnson's induction, has that been accomplished. "But I won a Southern 500 for him. I'd still be driving for him, but the factories [car manufacturers] said they were only going to keep two teams with full backing," said Baker, who moved over to team with Richard Petty. "I never left because I was unhappy with Cotton. If you're going to look for somebody to race for who wouldn't put any pressure on you, he was the one. "The ones to which Owens applied the pressure were the other cars on the track. Whether as a driver or car owner, he applied plenty of that. Owens made his mark as a driver in the modified division, which predated even NASCAR, winning more than 100 races and earning the nickname "King of the Modifieds." But he also scored nine wins in the Grand National Series (now Sprint Cup) behind the wheel, and that included the first win for Pontiac, on Daytona's old beach-road course, in 1957. He also scored wins on the beach-road track in 1953 and '54, in a modified '38 Plymouth. He raced modifieds, he said, because back in the 1940s and '50s, "I could make more money with my modified. We didn't run as many laps, and didn't use as many tires, or use nearly the same amount of fuel. And you could drive home every night." He did OK in the Grand Nationals, too. In fact, he is one of the few drivers still around who drove in the first Southern 500 in 1950. In a field of 75 cars, he finished seventh, driving a little Plymouth similar to the one driven by the winner, Johnny Mantz. 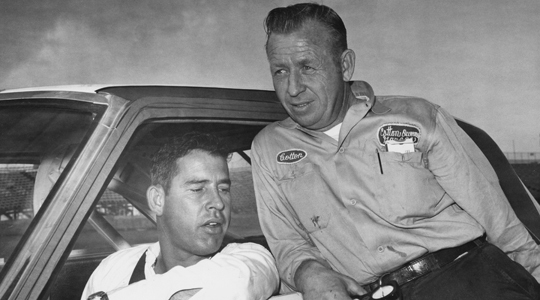 Owens was injured at Richmond in 1951, curtailing his driving career, but as owner he went to the top.More than 30 drivers won a total of 38 Grand National races behind the wheel of Owens' cars, including hall of famers Baker, Junior Johnson and fellow Spartanburg native David Pearson. Pearson, in fact, drove an Owens Dodge to 15 victories, 28 top-five finishes and 33 top-10s in 42 races in 1966, winning the Grand National championship and the owner's title for Owens. On March 24, 1970, Baker drove a Dodge Daytona prepared by Owens to the first lap at over 200 miles per hour (200.447) on an enclosed course in any type of auto, at Talladega Superspeedway. But it was pretty hard to top that weekend at Darlington. "He had relaxed with it and wasn't right up on the wheel right there at the end. He was thinking about cashing the check." Darlington still holds a pretty good chunk of Owens' heart, too. At the track's inaugural Darlington Historic Racing Festival in September 2008, Owens was one of the featured guests, and he brought one of the Dodges that Pearson drove in 1964.